As architect for the exterior of this 273-unit apartment building complex, Robert Cane was given the challenge of incorporating four 19th century row houses into the new structure. 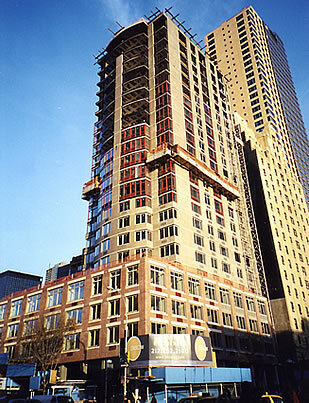 His design respects the detailing of the old buildings and their scale (the 23-story tower on 42nd Street and the 10-story 43rd Street wing are united by a 4-story base.) The tower’s west façade is a gently curved metal and glass curtain wall, accentuated by a deep red color on window mullions and floor slab covers. Marking the entrance is a steel and glass canopy suspended from the fourth floor on long cables.